We are committed to providing a positive learning environment for children ages 0 months to 6 years that will enhance their individual level of development. The centre is divided into 3 separate rooms with a playground for outdoor activity. The centre is located in Ajax, Ontario conveniently close to major bus routes (including GO Transit) and the Highway 401. We also serve families from surrounding areas in the Durham Region such as Pickering, Whitby and Oshawa as well as Toronto. Please call us for additional information or to make an appointment to tour our Centre. All parents of enrolled children are welcome to visit the school at any time to observe their child. We also encourage you to discuss your child's progress with our staff at any time. "My oldest daughter has been attending Learning Jungle School - Duffin's Bay for 9 years, and my youngest daughter has been there for 6 years. Over the years, we have found the staff to be stupendous, helpful, caring, and very creative. They are always coming up with various crafts and events for the children to participate in. As well, they are always easy to talk to in the event of any questions or concerns. I enrolled my oldest daughter at this daycare 9 years ago because I had a good feeling about the staff I had met, plus the atmosphere was very comfortable. The play area in the back is adequately fenced in, and my daughters have had many hours of fun play time there. Plus the daycare provides lunches every day so I do not have to worry about dealing with that aspect. 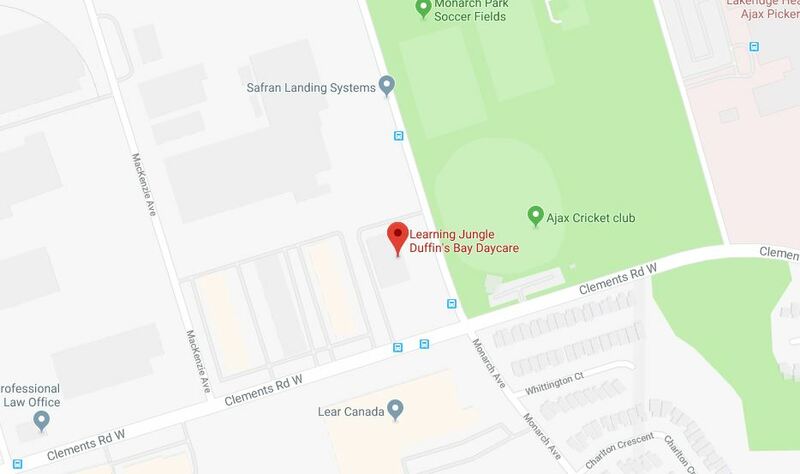 I would highly recommend Learning Jungle School – Duffin’s Bay Campus to any parent who is searching for a daycare centre for their child."